The vast majority of PCR methods rely on thermal cycling. Thermal cycling exposes reactants to repeated cycles of heating and cooling to permit different temperature-dependent reactions—specifically, DNA melting and enzyme-driven DNA replication. PCR employs two main reagents - primers (which are short single strand DNA fragments known as oligonucleotides that are a complementary sequence to the target DNA region) and a DNA polymerase. In the first step of PCR, the two strands of the DNA double helix are physically separated at a high temperature in a process called DNA melting. In the second step, the temperature is lowered and the primers bind to the complementary sequences of DNA. The two DNA strands then become templates for DNA polymerase to enzymatically assemble a new DNA strand from free nucleotides, the building blocks of DNA. As PCR progresses, the DNA generated is itself used as a template for replication, setting in motion a chain reaction in which the original DNA template is exponentially amplified. Forensic DNA typing has been an effective way of identifying or exonerating criminal suspects due to analysis of evidence discovered at a crime scene. The human genome has many repetitive regions that can be found within gene sequences or in non-coding regions of the genome. Specifically, up to 40% of human DNA is repetitive. There are two distinct categories for these repetitive, non-coding regions in the genome. The first category is called variable number tandem repeats (VNTR), which are 10-100 base pairs long and the second category is called short tandem repeats (STR) and these consist of repeated 2-10 base pair sections. 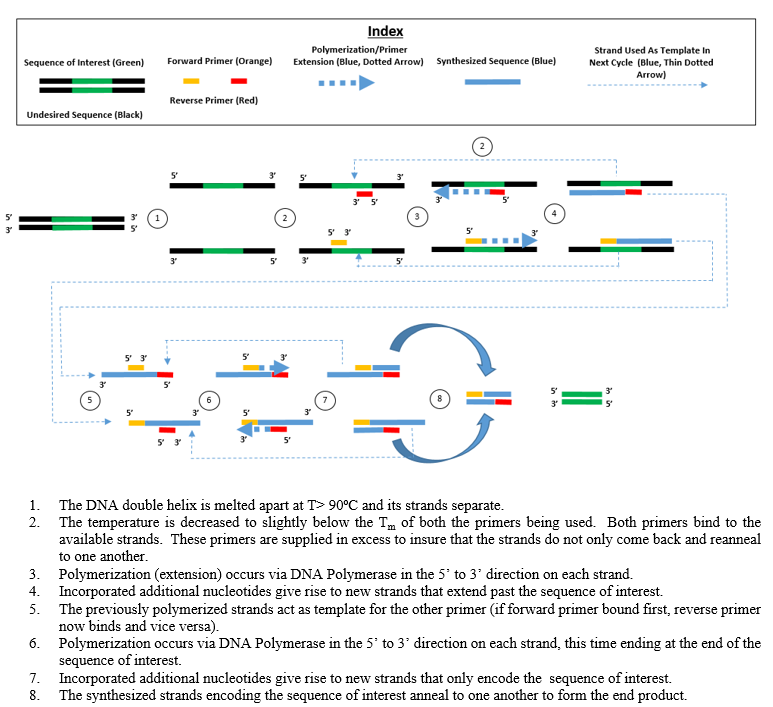 PCR is used to amplify several well-known VNTRs and STRs using primers that flank each of the repetitive regions. The sizes of the fragments obtained from any individual for each of the STRs will indicate which alleles are present. By analyzing several STRs for an individual, a set of alleles for each person will be found that statistically is likely to be unique. Researchers have identified the complete sequence of the human genome. This sequence can be easily accessed through the NCBI website and is used in many real-life applications. 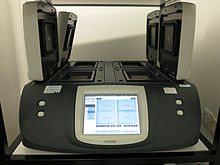 For example, the FBI has compiled a set of DNA marker sites used for identification, and these are called the Combined DNA Index System (CODIS) DNA database. Using this database enables statistical analysis to be used to determine the probability that a DNA sample will match. PCR is a very powerful and significant analytical tool to use for forensic DNA typing because researchers only need a very small amount of the target DNA to be used for analysis. For example, a single human hair with attached hair follicle has enough DNA to conduct the analysis. Similarly, a few sperm, skin samples from under the fingernails, or a small amount of blood can provide enough DNA for conclusive analysis. Nanoparticle-Assisted PCR (nanoPCR): In recent years, it has been reported that some nanoparticles (NPs) can enhance the efficiency of PCR (thus being called nanoPCR), and some even perform better than the original PCR enhancers. It was also found that quantum dots (QDs) can improve PCR specificity and efficiency. Single-walled carbon nanotubes (SWCNTs) and multi-walled carbon nanotubes (MWCNTs) are efficient in enhancing the amplification of long PCR. Carbon nanopowder (CNP) was reported be able to improve the efficiency of repeated PCR and long PCR. ZnO, TiO2, and Ag NPs were also found to increase PCR yield. Importantly, already known data has indicated that non-metallic NPs retained acceptable amplification fidelity. Given that many NPs are capable of enhancing PCR efficiency, it is clear that there is likely to be great potential for nanoPCR technology improvements and product development. Mullis was awarded the Nobel Prize in Chemistry in 1993 for his invention, seven years after he and his colleagues at Cetus first put his proposal to practice. Mullis’s 1985 paper with R. K. Saiki and H. A. Erlich, “Enzymatic Amplification of β-globin Genomic Sequences and Restriction Site Analysis for Diagnosis of Sickle Cell Anemia”—the polymerase chain reaction invention (PCR) -- was honored by a Citation for Chemical Breakthrough Award from the Division of History of Chemistry of the American Chemical Society in 2017. ^ a b Saiki, R.; Gelfand, D.; Stoffel, S.; Scharf, S.; Higuchi, R.; Horn, G.; Mullis, K.; Erlich, H. (1988). "Primer-directed enzymatic amplification of DNA with a thermostable DNA polymerase". Science. 239 (4839): 487–491. doi:10.1126/science.2448875. PMID 2448875. ^ J., Ninfa, Alexander; P., Ballou, David (2004). Fundamental laboratory approaches for biochemistry and biotechnology. Wiley. ISBN 978-1891786006. OCLC 633862582. ^ Cheng, S.; Fockler, C.; Barnes, W. M.; Higuchi, R. (1994). "Effective Amplification of Long Targets from Cloned Inserts and Human Genomic DNA". Proceedings of the National Academy of Sciences. 91 (12): 5695–5699. doi:10.1073/pnas.91.12.5695. PMC 44063. PMID 8202550. ^ Carr AC, Moore SD (2012). Lucia, Alejandro (ed.). "Robust quantification of polymerase chain reactions using global fitting". PLoS ONE. 7 (5): e37640. doi:10.1371/journal.pone.0037640. PMC 3365123. PMID 22701526. ^ P., Ballou, David; Marilee., Benore (2010). Fundamental laboratory approaches for biochemistry and biotechnology. John Wiley. ISBN 9780470087664. OCLC 420027217. ^ Quill E "Blood-Matching Goes Genetic" Science Magazine (14 March 2008) pp. 1478–1479. ^ Kwok S et al. "Identification of HIV sequences by using in vitro enzymatic amplification and oligomer cleavage detection." J. Virol. vol. 61(5) pp. 1690–4 (1987). ^ Yeh, Sylvia H.; Mink, ChrisAnna M. (2012). Netter's Infectious Diseases. ^ Ninfa, Alexander; Ballou, David P.; Benore, Marilee (2009). Fundamental Laboratory Approaches for Biochemistry and Biotechnology. United States: Wiley. pp. 408–410. ISBN 9780470087664. ^ a b c Ninfa, Alexander; Ballou, David; Benore, Marilee (2009). Fundamental Laboratory Approaches for Biochemistry and Biotechnology. United States: Wiley. pp. 408–410. ISBN 978-0470087664. ^ Alonso, A (28 January 2004). "Real-time PCR designs to estimate nuclear and mitochondrial DNA copy number in forensic and ancient DNA studies". Forensic Science International. 139 (2–3): 141–149. doi:10.1016/j.forsciint.2003.10.008. ISSN 0379-0738. PMID 15040907. ^ Boehnke M et al. "Fine-structure genetic mapping of human chromosomes using the polymerase chain reaction on single sperm." Am J Hum Genet vol. 45(1) pp. 21–32 (1989). ^ Garibyan, Lilit; Avashia, Nidhi (1 March 2013). "Polymerase Chain Reaction". Journal of Investigative Dermatology. 133 (3): 1–4. doi:10.1038/jid.2013.1. ISSN 0022-202X. PMC 4102308. PMID 23399825. ^ Zhou, Y H; Zhang, X P; Ebright, R H (11 November 1991). "Random mutagenesis of gene-sized DNA molecules by use of PCR with Taq DNA polymerase". Nucleic Acids Research. 19 (21): 6052. doi:10.1093/nar/19.21.6052. ISSN 0305-1048. PMC 329070. PMID 1658751. ^ Innis MA, Myambo KB, Gelfand DH, Brow MA (1988). "DNA sequencing with Thermus aquaticus DNA polymerase and direct sequencing of polymerase chain reaction-amplified DNA". Proc Natl Acad Sci USA. 85 (24): 9436–9440. doi:10.1073/pnas.85.24.9436. PMC 282767. PMID 3200828. ^ Pierce KE & Wangh LJ (2007). Linear-after-the-exponential polymerase chain reaction and allied technologies Real-time detection strategies for rapid, reliable diagnosis from single cells. Methods Mol Med. Methods in Molecular Medicine™. 132. pp. 65–85. doi:10.1007/978-1-59745-298-4_7. ISBN 978-1-58829-578-1. PMID 17876077. ^ Krishnan, Madhavi; Ugaz, Victor; Burns, Mark (2002). "PCR in a Rayleigh-Benard convection cell". Science (298.5594): 793. ^ Herman JG, Graff JR, Myöhänen S, Nelkin BD, Baylin SB (1996). 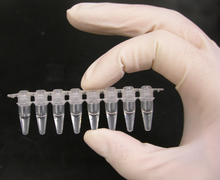 "Methylation-specific PCR: a novel PCR assay for methylation status of CpG islands". Proc Natl Acad Sci USA. 93 (13): 9821–9826. doi:10.1073/pnas.93.18.9821. PMC 38513. PMID 8790415. ^ Cenchao Shen; Wenjuan Yang; Qiaoli Ji; Hisaji Maki; Anjie Dong; Zhizhou Zhang (2009). "NanoPCR observation: different levels of DNA replication fidelity in nanoparticle-enhanced polymerase chain reactions". Nanotechnology. 20 (45): 455103. doi:10.1088/0957-4484/20/45/455103. PMID 19822925. ^ Shen, Cenchao (2013). An Overview of Nanoparticle‐Assisted Polymerase Chain Reaction Technology. US: Wiley-Blackwell Publishing Ltd. pp. 97–106. ^ Moller, Simon (2006). PCR (THE BASICS). US: Taylor & Francis Group. p. 144. ^ David F, Turlotte E (1998). "Une méthode d'amplification génique isotherme" [An Isothermal Amplification Method]. Comptes Rendus de l'Académie des Sciences, Série III. 321 (11): 909–914. doi:10.1016/S0764-4469(99)80005-5. ISSN 0764-4469. ^ Raoult, D; G Aboudharam; E Crubezy; G Larrouy; B Ludes; M Drancourt (7 November 2000). "Molecular identification by "suicide PCR" of Yersinia pestis as the agent of medieval black death". Proc. Natl. Acad. Sci. U.S.A. 97 (23): 12800–12803. doi:10.1073/pnas.220225197. ISSN 0027-8424. PMC 18844. PMID 11058154. ^ Mullis, Kary (1990). "The unusual origin of the polymerase chain reaction". Scientific American. 262 (4): 56–61, 64–5. doi:10.1038/scientificamerican0490-56. PMID 2315679. ^ Patidar, Madhvika; Agrawal, Suraksha; Parveen, Farah; Khare, Parul (2015). "Molecular insights of saliva in solving paternity dispute". Journal of Forensic Dental Sciences. 7 (1): 76–79. doi:10.4103/0975-1475.150325. ISSN 0975-1475. PMC 4330625. PMID 25709326. ^ Saiki, R.; Scharf, S; Faloona, F; Mullis, K.; Horn, G.; Erlich, H.; Arnheim, N (20 December 1985). "Enzymatic amplification of beta-globin genomic sequences and restriction site analysis for diagnosis of sickle cell anemia". Science. 230 (4732): 1350–1354. doi:10.1126/science.2999980. ^ Advice on How to Survive the Taq Wars ¶2: GEN Genetic Engineering News – Biobusiness Channel: Article. May 1, 2006 (Vol. 26, No. 9).